L-R: Margreet Peverelli from Cashbook with Katerina Simerdova; Wallace Guimaraes; and Petra Mazlova from Epiroc at their SSC in Prague. Epiroc is a leading global productivity partner for the mining and infrastructure industries. With cutting-edge technology, Epiroc develops and produces innovative, safe and sustainable drill rigs, rock excavation and construction equipment and tools. The company also provides world-class service and solutions for automation and interoperability. Epiroc are a leading partner for both mining equipment and infrastructure equipment. They have their European shared service center base in Prague, Czech Republic. Epiroc Czech were specifically looking for a solution that could automate their Cash Application and Bank Reconciliation finance functions. They also required a fully customizable management-level reporting and forecasting tool. Epiroc are managing the financial accounts for 4 different European locations: Italy, France, Spain and Portugal. Epiroc wanted a cash automation solution provider which had previous experience of shared service centers (SSC). Cashbook were chosen over a number of other competitors due to great references from our existing SSC customers in Europe. Epiroc are using BPCS 5.0 ERP system. Cashbook have been an Infor partner since 2010 and have multiple customers on the BPCS/LX ERP systems. Any new implementation on this ERP is always a smooth and efficient project for Cashbook and our client. Our Cash Application and Bank Reconciliation automation software works in harmony with BPCS, multiple banks and customers. Epiroc Czech operate in four different environments with two separate banks, two different bank statement imports and multiple bank accounts. The challenge for Cashbook was having one single installation in four different environments. Cashbook’s Cash Manager tool provides Epiroc with a fully customizable reporting and forecasting tool that can be used by top level management. Cash Manager will allow them to see what invoices have been paid, and to predict when all outstanding payments should be complete. Cash manager allows drill down reporting and offers multiple report types. This gives an extremely high visibility of the current SSC cash position to Epiroc. Four environments installed and Cashbook integrates with each one to adhere to Epiroc’s segregation of work. The update process for Cash Application activity in Cashbook updates BPCS in real time. Epiroc now has automated statements in MT940 and CSV formats. Allocation of statement receipts to real time invoices. Cashbook algorithms analyse imported data for auto allocation of cash to invoices. Increased automation of Bank Reconciliations. There will be a huge reduction in time spent on the Bank Rec process. Improved cash visibility across European cash flows. As mentioned previously, Cashbook have past experience in projects with SSC’s across Europe and the world. There was a very smooth implementation between Cashbook, BPCS and the multiple environments. Epiroc Czech went live with Cashbook on 11th March 2019, after just two months of an implementation process. They will be using Bank Reconciliation and Cash Manager fully by the end of this month. As Epiroc are live only a number of days, it is too early to produce a statistical analysis of their automation performance. However, they are already seeing the business process efficiencies that Cashbook automation has brought to the SSC. There is a huge reduction in the requirement for manual entries in Cash Application. Over the next few months, they will truly see the advantages of automating their complex finance functions, and their SSC will be operating at a much more consistent, transparent and streamlined level. 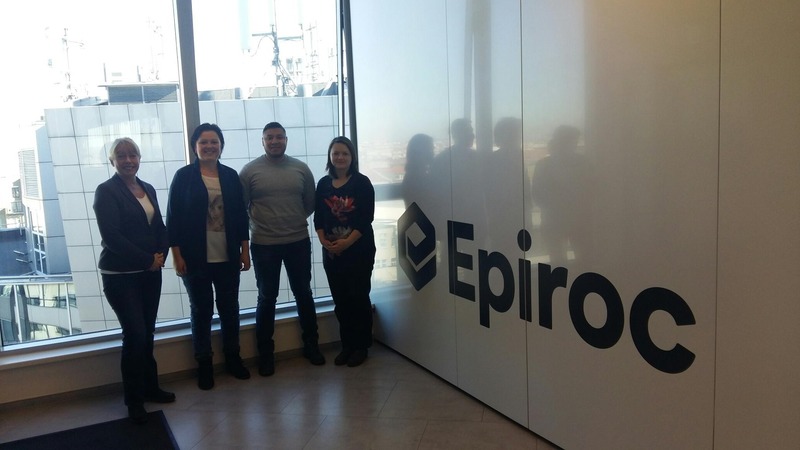 Cashbook would like to thank Epiroc Czech, it was a pleasure to work with them on this project. They gave Cashbook such a warm welcome in their beautiful office overlooking Prague. We look forward to working with Epiroc long into the future. If you’re interested in our Cash Automation solutions, please get in touch to see how we can transform your finance department. You can contact us here to request a discovery call or product demo.